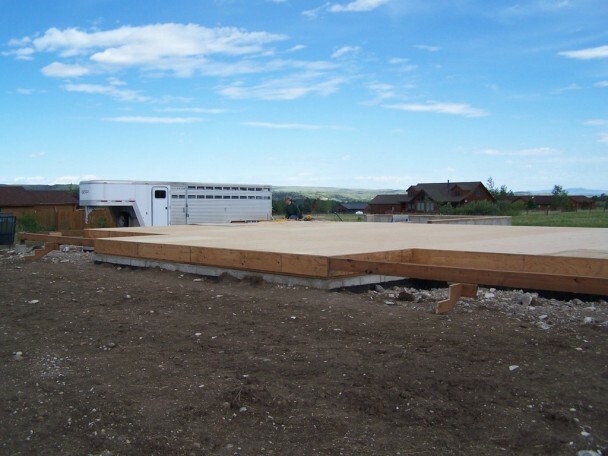 With a handcrafted log home such as we are building here in Gallatin Gateway, Montana the subfloor and foundation must be in place before the logs arrive. 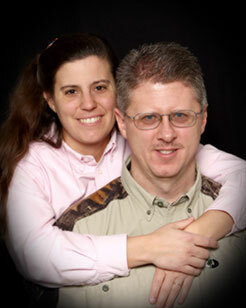 We are working towards a delivery date of June 25th, 2012 for the first semi load of logs. The second and third shipments will arrive on the 26th and 27th of this month. The Bear Creek log shell is about 8 rows high now in the log yard. 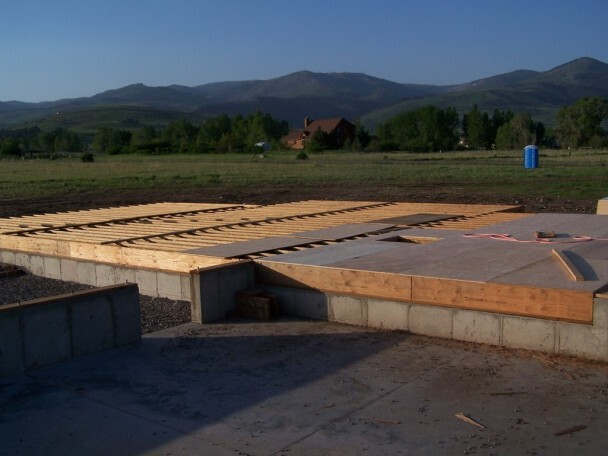 Not only must the foundation and subfloor must be finished– it also has to be t0tally correct. 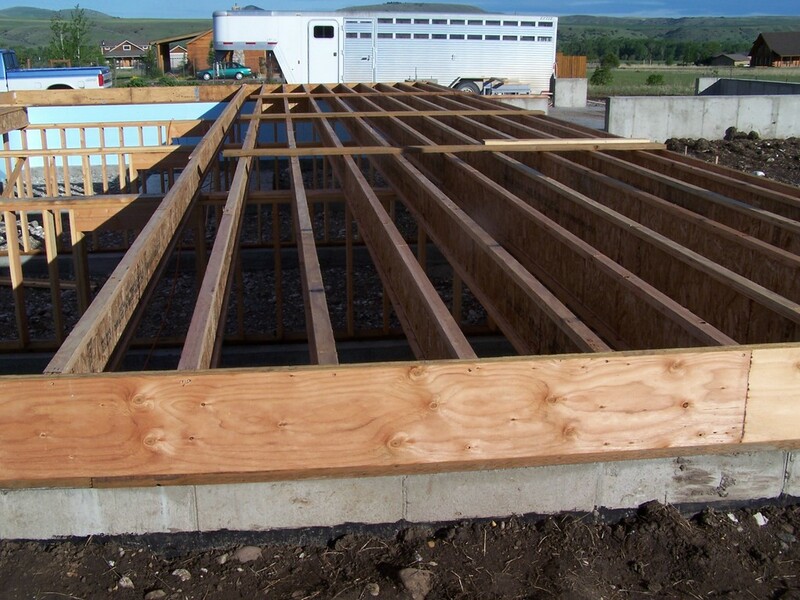 Here we see the TGI floor joists being set into place. The sill plate and rimboard were installed in our last site preparation page. One challenge to this process is the spacing of the anchor bolts on the top of the log walls. The joists have to be spaced precisely, and they also have to work in accordance with the anchor bolts that will come up and tie into the first row of logs. Here we see 10 TGI’s spaced from the rear of the home to the front. The kick out for the great room is located in the center top of the photo. 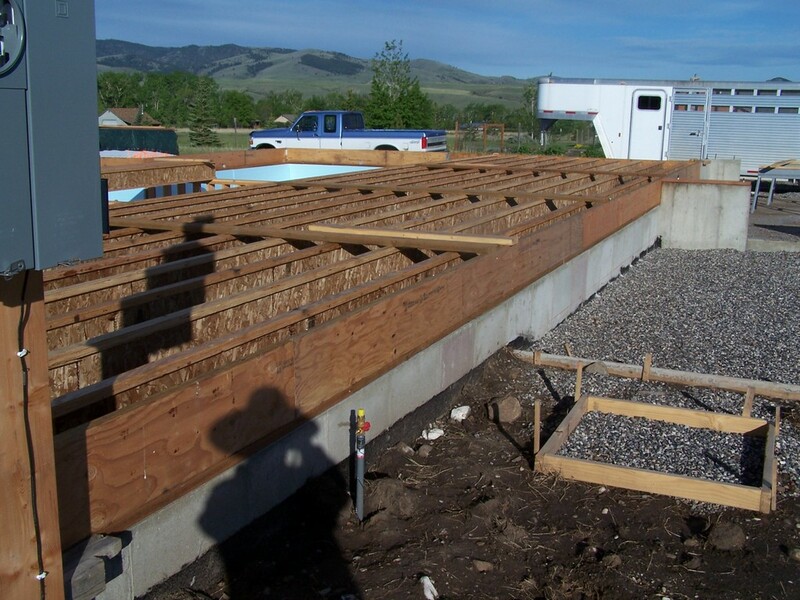 With the heavy weight of the logs footers run along under all of the interior log walls. There is also a second footer for support down the center of the great room. 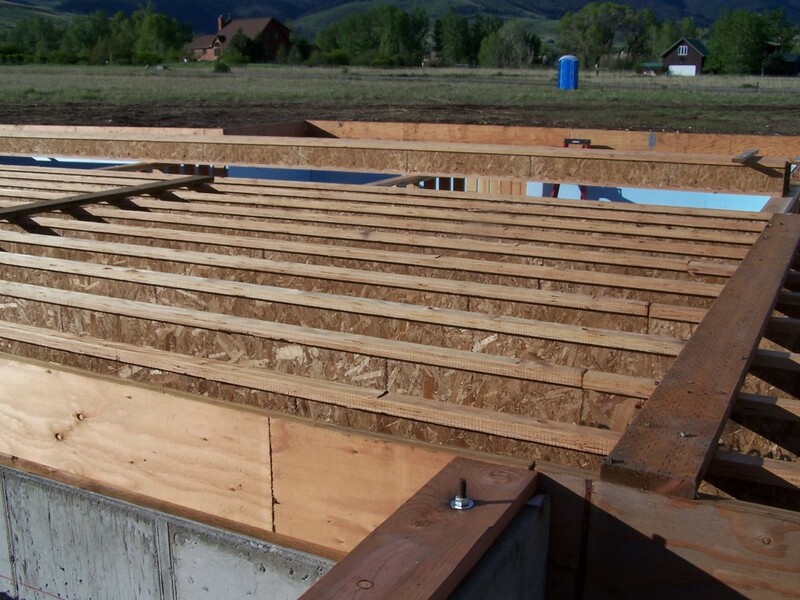 This photo shows the joists under the master bedroom and bath being set. The access hole for the crawlspace is visible to the right. We have added a few extra boards to insure that the TGI’s are level from one joist to the next. Everything must be checked and double checked. When the logs arrive there will be no time for corrections. During the unloading and restacking of the logs there are time frames for how long we have to unload the truck with out incurring extra truck time. Also there is crane time and the building crew. So accuracy now is vital to the flow of the job site. Here is a side view of the joists spanning the crawl space. 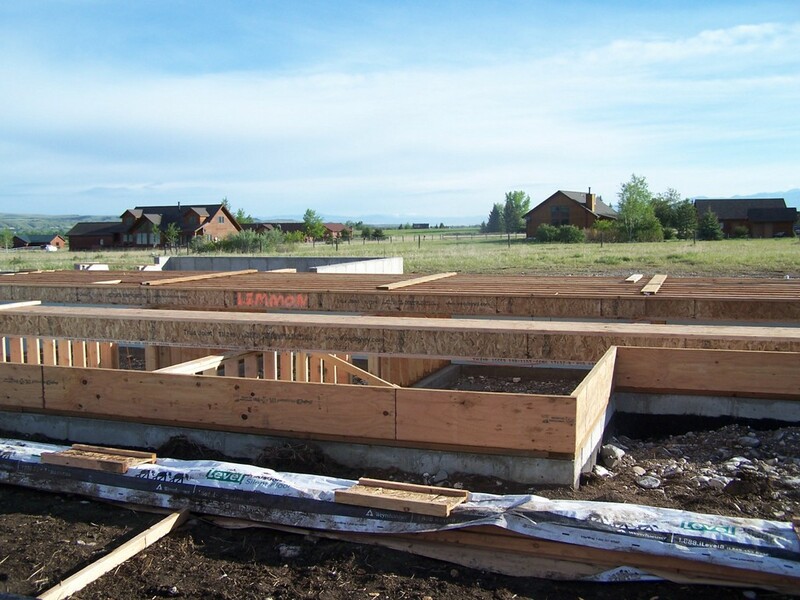 Once the TGI’s are doubled checked for spacing then the sheathing is installed. We began laying the sheathing from the front right corner of the foundation. An access hole was cut for the crawl space. Once all the sheathing is in place we also cut the stair stringers and located them where the cement pads will be poured for the stair landings. 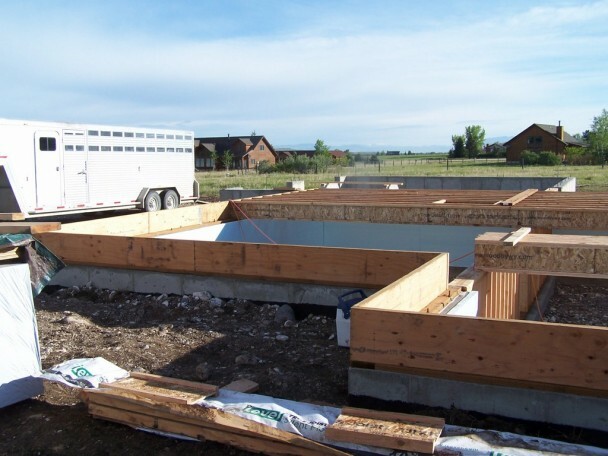 The open spaces on the two front sides of the foundation are for the front porches. Decking will be installed for these areas. 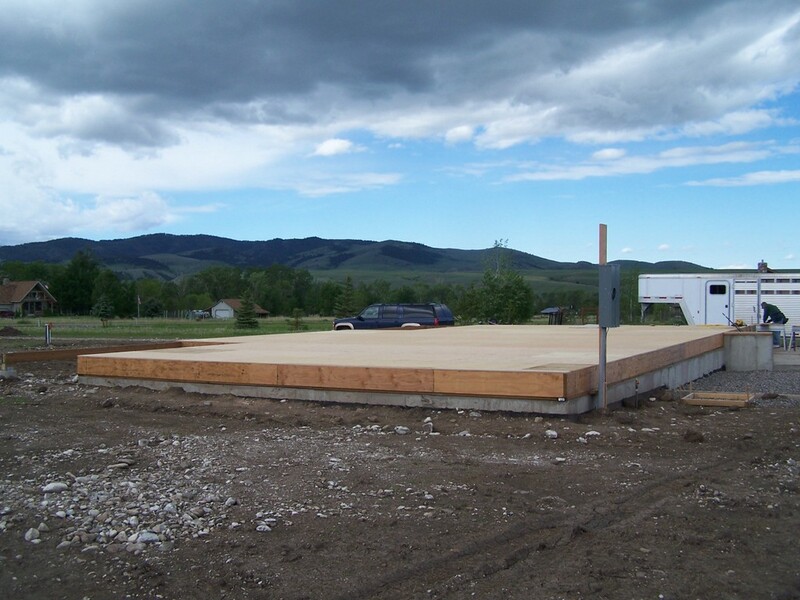 And here is is the sub-floor from the far back corner. We are all ready for the logs to arrive.